Auto complete provides support for selecting multiple items through token representation on control loading. Step 1: Add the required assemblies to get the view of AutoComplete. Step 2: Set the MultiSelectMode to Token. Step 3 : Bind the DataSource property with the SelectedItem in the SfAutoComplete. Step 4: In the ViewModel class create two private varaiable of Observable Collections and add the AutoComplete items in the collections. Step 5: The items added in the collection which are binded in the SelectedItem will be selected item which are shown in token representation while control get loaded. 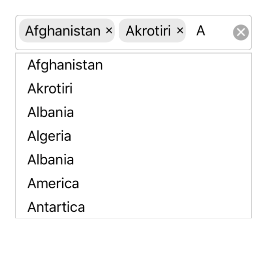 Selected items from the suggestion list is viewed in token representation in AutoComplete. The following code illustrates how to achieve this method. Unhandled Exception: System.ArgumentOutOfRangeException: Index was out of range. Must be non-negative and less than the size of the collection. Parameter name: index occurred.